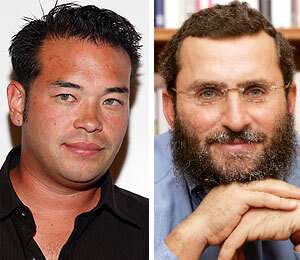 Jon Gosselin Asks Rabbi Shmuley for Help! He's going through a messy public divorce, TLC wants his moolah, and the media slams him day after day. Finally, Jon Gosselin is ready to admit he needs advice! Jon stopped by Central Synagogue in New York City for the "This World on the Values Network" event on Sunday. The troubled reality TV star asked the panel for some tips. "Obviously I'm going through a divorce. It's pretty public." He asked, "What two or three values can I use to raise good kids?" The panel included author Elie Wiesel, Dr. Mehmet Oz, Newark Mayor Cory Booker and Rabbi Shmuley Boteach. Shmuley answered Gosselin. "It's great to walk down the street and people recognize you, but you have a good heart and you've got 8 kids and I've got 9 kids and that's one of the reasons we can bond." He added, "We have to raise good kids. As I always say, 'Are you really a success in life if the people who mean most to you think the least of you?'" Rabbi Shmuley tells "Extra" he believes Jon has a "very good heart" and he's "just losing his bearings in this world of celebrity." The rabbi wants to "help him find his moral center."